PALO ALTO, CA, July 25, 2017 – Striim, provider of the leading end-to-end data integration and streaming analytics platform, announced today that Striim for IoT has received the 2017 Product of the Year Award from IoT Evolution magazine and IoT Evolution World, the leading magazine and Web site covering IoT technologies. “The solutions selected for the IoT Evolution Product of the Year Award reflect the diverse range of innovation driving the machine-to-machine market today. It is my honor to congratulate Striim for their innovative work and superior contribution to the rapidly evolving IoT industry,” said Carl Ford, CEO of Crossfire Media, a co-publisher of IoT Evolution. Award winners will be published in the next issue of IoT Evolution magazine. 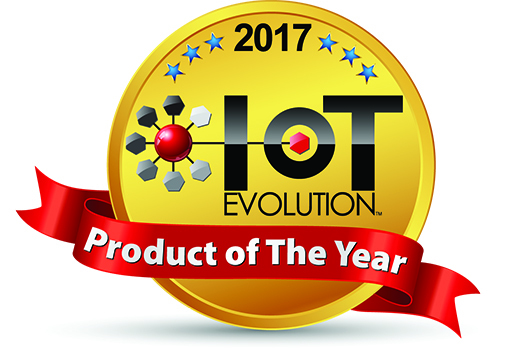 Along with the 2017 IoT Evolution Product of the Year Award, Striim was also presented with the Award for Best IoT-Specific Code or Development Solution at IoT Evolution Expo in July. Learn why Striim for IoT was recognized so highly by IoT Evolution by reading the related blog post, the Striim for IoT press release, or Striim’s solutions page for IoT. Striim® (pronounced “stream”) is an enterprise-grade, real-time data integration and intelligence platform. Striim makes it easy to ingest and process high volumes of streaming data – including change data capture – for real-time log correlation, cloud integration, edge processing, and streaming analytics. Companies worldwide use Striim to deliver real-time data integration, analysis and visualization for a wide variety of use cases including data security, fraud, SLA monitoring, customer experience, replication, data modernization, and Internet of Things (IoT) analytics. Please visit www.striim.com, read our blog at www.striim.com/blog, follow @striimteam, or download the Striim platform.